Strap in, today’s a busy one! We are continuing to build on the email marketing theme. 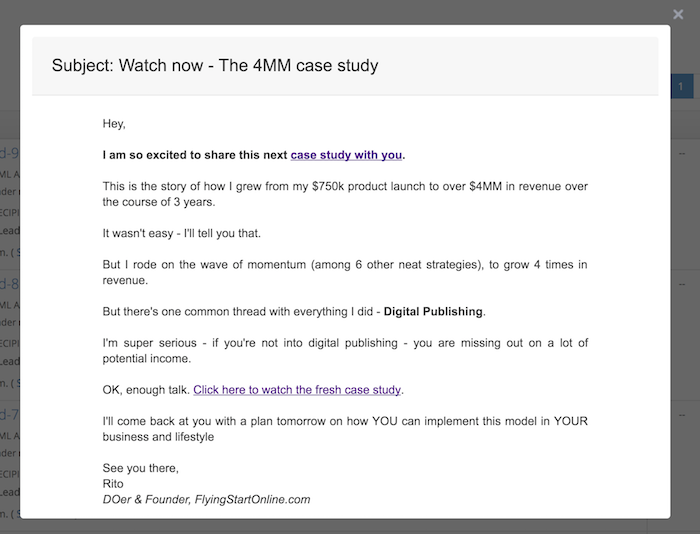 Email marketing isn’t something online marketers do just because they can. They do it because it’s highly effective at helping business owners and consumers alike stay connected. 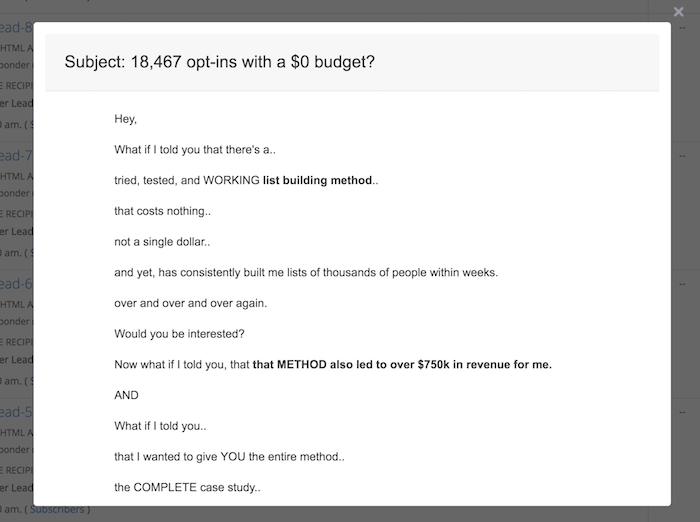 Yesterday we covered 5 Steps To Write An Email Autoresponder That Converts. 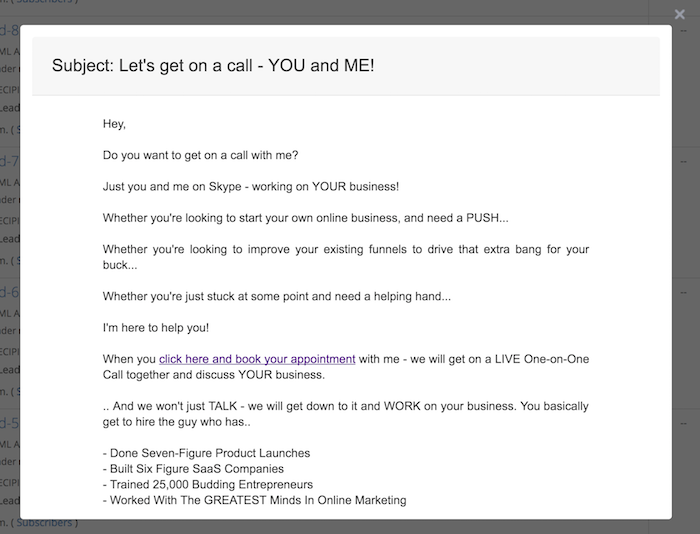 To quickly recap, autoresponders are emails designed to get subscribers to take an action. All the while adding to your authority and cultivating a loyal tribe. Today, Day 17, we’re actually writing some more emails! Follow along in the video as Rito channels his inner email writing Zen to produce some killer content. Use his emails as creative inspiration for your own lists. And remember to have fun with this! Keep it comfortable for both you and your subscribers. If you’re feeling like it’s a chore to write the autoresponder emails, it’s going to feel like a chore to read them. When conducting your email marketing and creating autoresponder emails, the vital component of successful marketing is consistency. Consistent email marketing is important to your business because it educates your subscribers, boosts sales, and forms a relationship with your readers. This one will definitely catch your subscribers off guard. Give them a free gift of high value just for being your subscriber. The amount of gratitude they will feel helps cultivate a sell in the future. When you give, especially unexpectedly, it makes people want to reciprocate. And with this one, we drop the bomb. We offer our own personal testimonial, proof and a chance to have the “Secret” aka Competitive Edge aka Game Changer revealed. 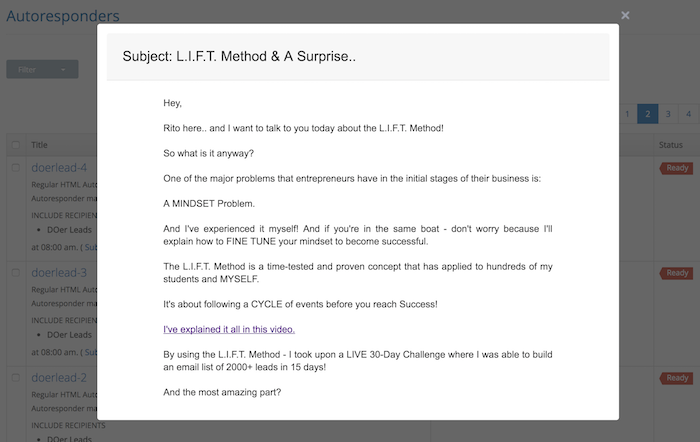 An email worded in a manner that invokes curiosity, hope and scarcity all in the same message will likely convert. 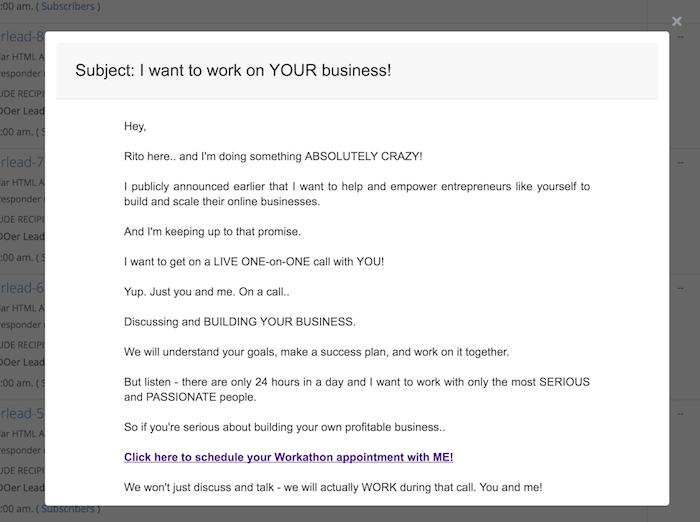 To fine tune your email game, definitely check out Inbox Blueprint. We are not emailing today. We want to assume subscribers are using this time to implement. Not too mention we are full aware of the inbox inundation many of us struggle with. Speaking of implement, use this “off” time to write more emails for the coming week. By offering private consulting, not only are you potentially creating an additional revenue stream, you’re also continuing to position yourself as an authority. People don’t want some average schmuck telling them whats what. They want a seasoned vet who has been in the trenches and knows what it’s like to be in their shoes. And if you’re interested in some private consulting yourself, I invite you to check out Rito’s private live coaching. By doing this, we’re still appearing as an authority, but it also gives the impression that we really just might care. Taking time out of your busy schedule to help somebody, is a surefire way to gain trust. And trust is a surefire way to gain a loyal customer. By this point your subscriber knows your intentions but may still be on the fence for whatever reason. That makes today the PERFECT day for some proof. Case studies are great for this. If you decide to go the case study route, you can do so by telling either your own story or better yet, if you can provide it, a client testimonial. Rito went the route of his own personal journey which puts him on a relatable level with his user. Use your autoresponder emails to speak directly to your subscribers as though they were only one person while thoughtfully building trust and loyalty in your brand. Email marketing can also be integrated with nearly any marketing tactic, which makes email an important part of any marketing campaign. That’s it for Day 17 – Well done!